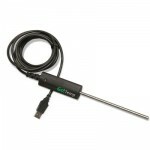 An easy to use data logging temperature sensor that connects directly to a USB port and measures temperatures from -20° to 115°C. Free downloadable Logger Lite software is included. Simply install the software, connect your Go!Temp and you're up and running, ready to measure, record and graph temperatures. Quick, hassle free, real value for money. Save money when you purchase the GT-TP Go!Temp Teacher Pack. Each pack includes 8 Go!Temp USB temperature sensors. This is the best value product for collecting temperature data and buying the bulk pack also saves school funds.